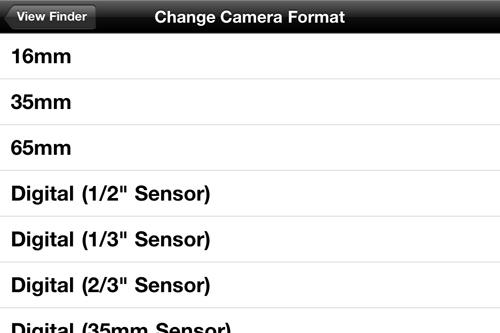 This is the 2nd in a series of posts about useful iPhone apps for film and video production. In the beginning, directors and photographers framed their shots with two hands, spreading thumbs and forefingers at right angles, then raising them together to define a rectangle. Simple and cheap. Analog and infinitely adjustable. But inaccurate for defining aspect ratios, impossible to calibrate to particular focal lengths, and, well, a bit pretentious to watch. So years ago, I bought my first director’s viewfinder, made by Birns and Sawyer, a metal cylinder with focal length scales for 16mm and 35mm on the sides. Twist the cylinder: the magnification increased or decreased, and the view appeared to zoom in or out, showing an approximation of the angle of view of various chosen focal lengths. 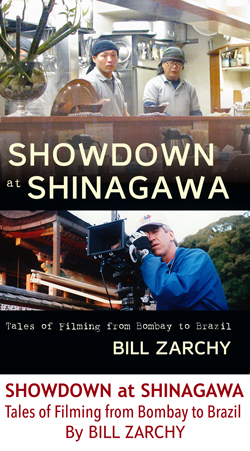 I used it frequently, mostly on tech scouts, to show directors the capabilities and limits of our zoom lenses, and on shoots to choose lenses when using fixed-focal length primes. The B&S finder had a default 1.33 aspect ratio, and soon I bought two plastic masks that slipped on the front and showed TV cutoff and 1:85. The finder came with a metal chain, which invariably caught in the mustache of one director I worked with. Eventually I removed the chain, but by them he had shaved off the ‘stache. Later Arri came out with a viewfinder accessory that showed the scene even more accurately, by mounting the actual lens you’ll shoot with. Both tools had advantages and disadvantages. Both let you view a scene without having the camera present, a huge plus, especially when scouting. The B&S finder never seemed to match our lenses exactly, though it was usually close enough for my needs. The Arri finder necessitated having your lens set present, which can be economically unfeasible when scouting for a low-budget shoot. It was pretty easy to use with primes, but cumbersome with zoom lenses. 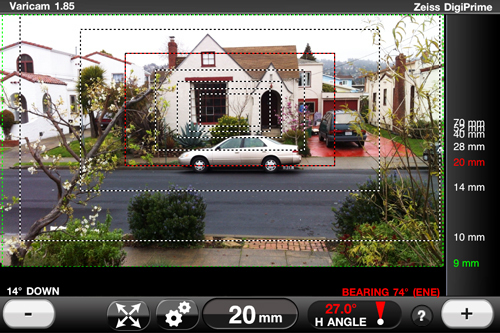 Artemis Director’s Viewfinder is a straightforward app that uses the iPhone’s camera as a viewfinder, allowing you to frame a scene with exactly the same field of view your lens will see when you shoot it. At $29.99, it’s a bit pricey for an app, but its utility and flexibility make it well worth the cost. First, you select a Camera Format from a list that includes three film formats (16mm, 35mm, and 65mm), four digital video formats (1/2”, 1/3”, 2/3” and 35mm sensors), digital high speed cameras, digital still cameras, and a place to enter custom camera information. For film, you then select a more specific format, choosing perfs, pulldowns, and shapes. For video, you choose a manufacturer and camera, such as the Sony EX3 in the ½” chip format, or the Varicam line in the 2/3” chip. 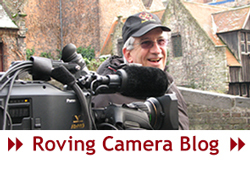 Many leading video cameras are included, along with a Generic Camera category in most formats. 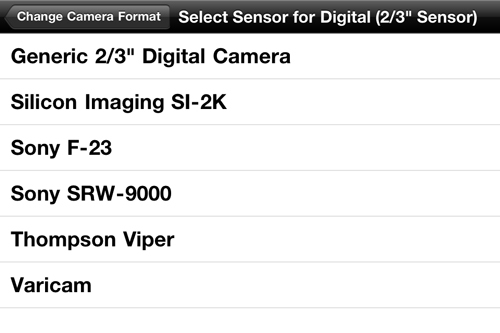 The Digital Still Camera category includes my Canon 5D Mark II. 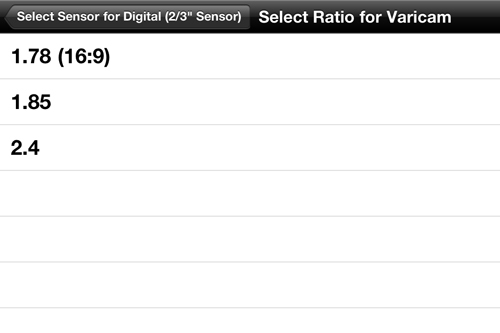 Each camera selection leads to a choice of Aspect Ratio, then a choice among lens manufacturers. 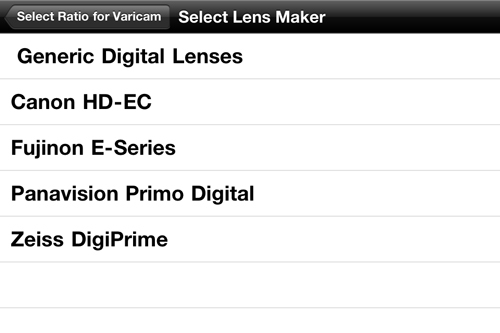 This is followed by a selection of lens focal lengths from wide angle to telephoto. 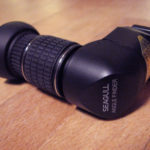 Select as few or many of these lenses for your virtual Lens Bag. Then click to Save Lenses. You can edit your Lens Bag at any time. 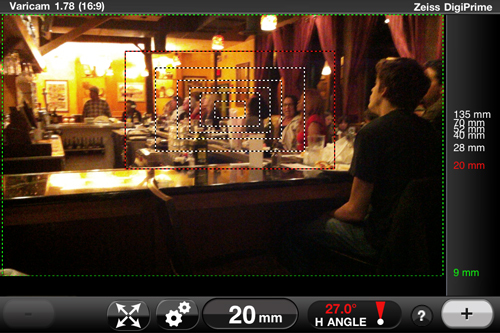 At this point, Director’s Viewfinder uses the iPhone’s camera to show you the relative fields of view of all the lenses in your bag in Overlay Mode. 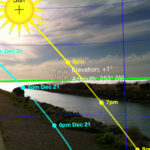 Each lens shows up as a concentric rectangle in the main viewfinder screen (though some of your lens choices may be too wide for the iPhone’s camera). 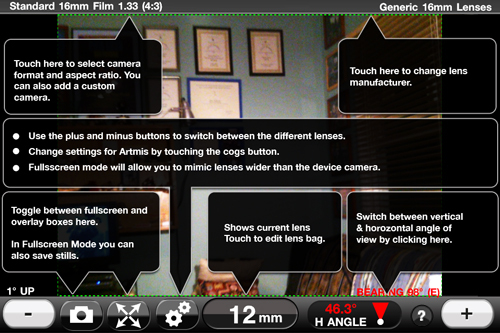 Overlay mode, showing Zeiss DigiPrime lenses from 9mm to 70mm. Note red rectangle on selected 20mm lens. Touching the screen display centers the smallest rectangle (the most telephoto lens) at that point on the screen, then arrays the other lens views around that. You can change your earlier selections by touching the Camera Format or Lens Maker displayed in the upper left and right corners. Clicking on the plus or minus buttons in the lower right and left corners changes which lens in your bag is selected (as indicated by a red rectangle). 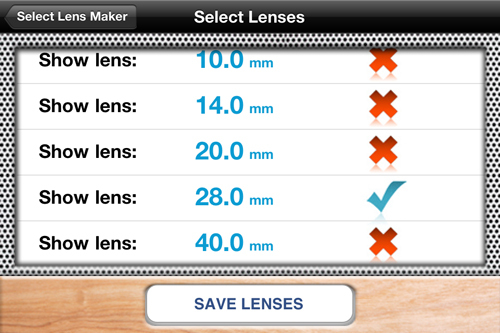 The focal length of the selected lens is displayed centered in the bottom toolbar). 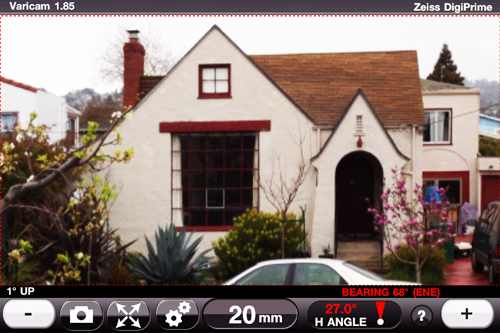 Clicking on the enlarging arrows zooms the view to that of the selected lens and activates a small Camera icon. This is called Full Screen Mode. Full Screen Mode, zoomed in to selected 20mm lens. Note tilt angle and compass bearing read-outs on left and right sides just above bottom toolbar. 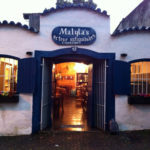 Click on the Camera icon, and your iPhone saves this view to your Camera Roll as a 480 x 320 JPEG, about 50-90 KB. 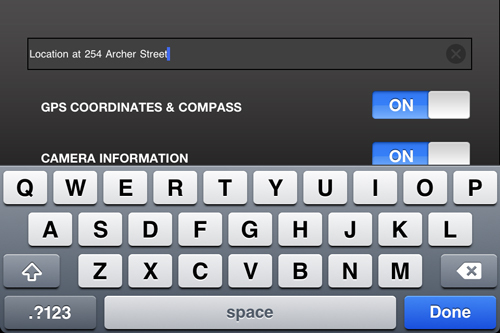 You can add information such as an address to Artemis Director’s Viewfinder’s views saved this way. 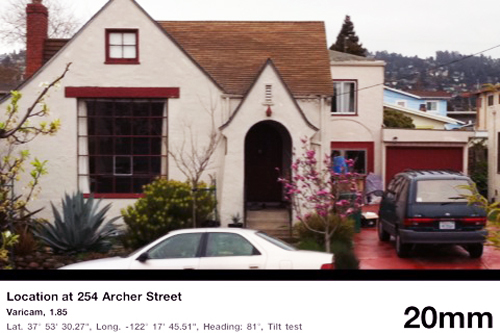 This frame was grabbed with Artemis Director’s Viewfinder’s internal screen capture function, which includes the GPS and compass info, and lets us add the address. The other illustrations in this post were saved using the iPhone’s own screen grab mode. Or you can save any view from within any app: the iPhone’s own OS allows you to create a frame grab by holding down the Home button and then tapping the Sleep/Wake button on top. This will save whatever is on screen as a 960 x 640 PNG image, usually about 1 MB. 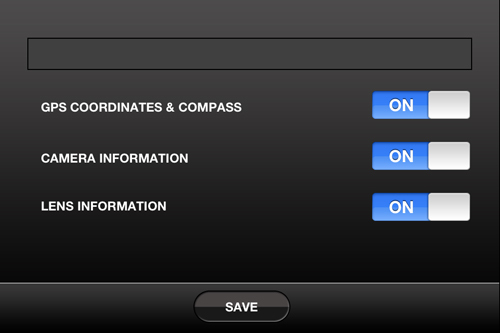 Director’s Viewfinder also includes a Cogs icon on the bottom toolbar which opens up various additional app settings, such as control of flash photography, display of tilt and bearing, and inclusion of metadata like GPS and compass coordinates, and camera and lens info. 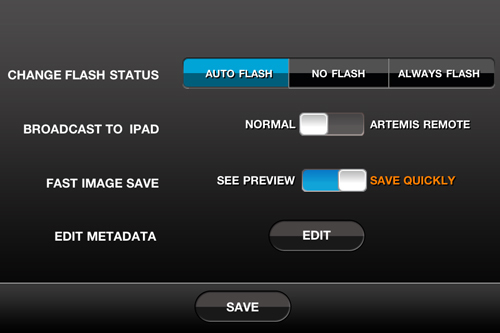 Or you can broadcast your views from the iPhone to an iPad, if you also purchase the mini-app Artemis Remote for $4.99. 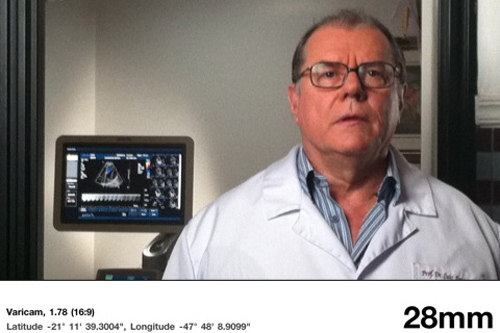 Next to your selected focal length along the bottom of the screen is a read-out of the Angle of View, which can be toggled from horizontal angle to vertical angle. To the right of that is a question mark. Touch here and a Help screen comes up, detailing the functions and features of various parts of the screen. Help screen, accessed by pressing the ? button on bottom toolbar. 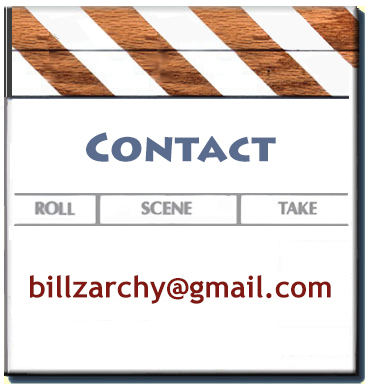 I used Artemis Director’s Viewfinder extensively during recent travels, primarily on tech scouts for location selection. 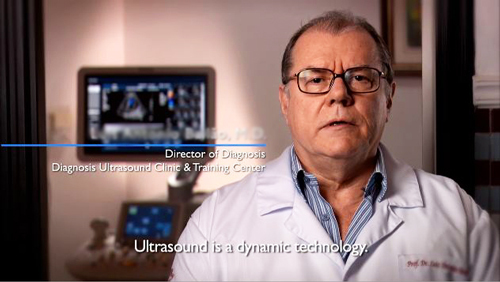 When we were shooting in Brazil, I wasn’t sure yet at first whether to trust the app, but several times I grabbed a frame with the app while we shot our interview in HD, holding the iPhone directly under the video lens while we were rolling. In each case, the fields of view are identical, though there are obvious differences in camera height, eyeline, framing, and depth of field. 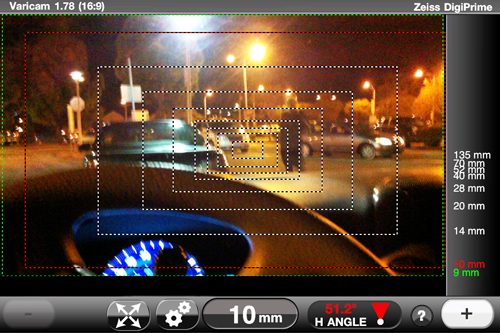 Artemis Director’s Viewfinder is a useful app for scouting and shooting. It’s accurate, easy to use, flexible, and fun. And it’s always in your pocket. 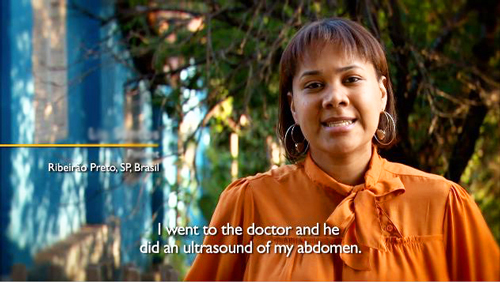 Brazil: My First iPhone Video Shot on an iPhone 4 in Ribeirão Preto, Brazil, and edited in iMovie. GREAT article even though it is a little technical for us non-techs. 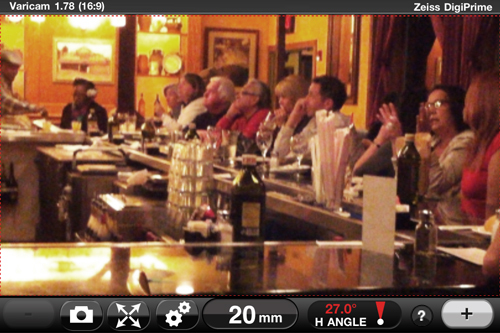 I’m sure videographers will appreciate the details concerning the app. Please keep the articles coming.